Brought to you by the Techno-Pagan Presbypartian Church, Holy Synod of Drunken Fools and JestersTM, Local 666*. * part of the massive worldwide conspiracy that no one knows about! Yes folks, Pope St. Flatus Ignitus is a legally ordained minister and the Technopagan Church is a legally recognized church! No kidding! The internet is full of information, most of it garbage. The ToxicSurfer is dedicated to tastefully (or not so tastefully if I find the page particularly irritating) pointing out horrendously intelligent, stupid, obnoxious, strange, disturbing and irritating web sites and hold them all up to the kudos or ridicule they so justly deserve. Documenting such sites is part of the new field of "Blogger Archaeology". Ah! A site to behold, absolutely outstanding! This is a must see site! Special thanks to: http://www.panoptes.org/ for calling this one to my attention! Want to Contribute to the list? or post to my guest book. I love hate mail! Send me lots! Copyright©2002 by The ToxicSurfer, all rights reserves, use with permission. Fnord! 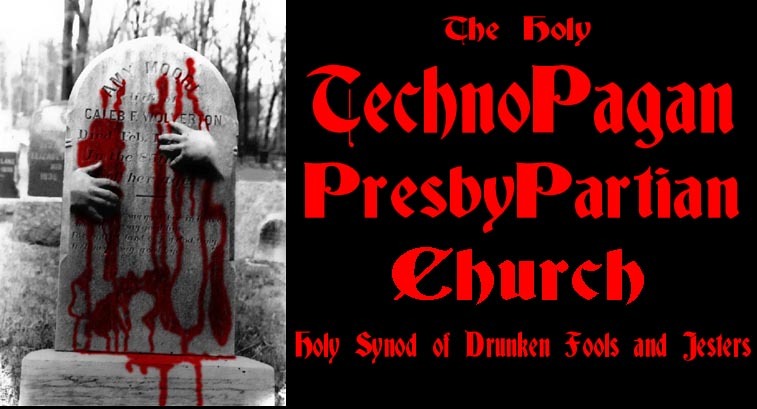 Brought to you by the Techno-Pagan Presbypartian Church, Holy Synod of Drunken Fools and JestersTM.